For millions of Americans, July conjures visions of beach parties and BBQs, but for me and mine, this month means only one thing: the Chicken Inferno! 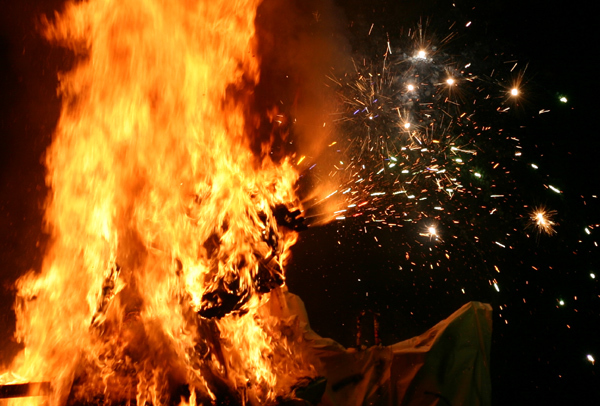 Every year, the third weekend of July presages a preposterous event, equal parts extended family reunion and outdoor art installation, assuming said art was stuffed with fireworks and set ablaze. That’s the Chicken Inferno, the closest thing rural Pennsylvania has to the Burning Man festival. The 9th annual Chicken Inferno was a stupendous affair, rich with all the best aspects of summer days with friends and family. Every year, we seem to add more children to the mix, but then again, we act like children ourselves. While doing my best to indulge in outdoor sports, poker games, and a never-ending flow of food and libations, I kept an eye on Potter County’s teeming summer wildlife. Actually, one thing I noticed was that the wildlife wasn’t nearly as wild as I’ve been accustomed to in prior years. The power lines on the hill used to be crowded with Eastern Bluebirds and American Goldfinches waging war with brigades of Red-winged Blackbirds. This year, blackbirds and finches (gold as well as House and Purple) appeared in modest numbers, while it took me until my last day there to spot a single bluebird. Same for swallows; Barn and Cliff Swallows were evident, but not in the flocks observed even one year ago. Most ominously, the din of spring peepers, long the soundtrack of our late night festivities, went completely unheard. Some birds still prosper on my father-in-law’s bucolic estate. Eastern Kingbirds, for example, flashed their white-tipped tails from practically every tree. 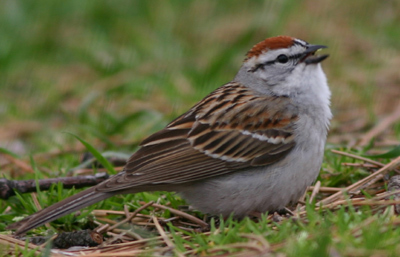 Sparrows, particularly Chipping Sparrows, popped up frequently, with Cedar Waxwing, American Crow, and Black-capped Chickadee appearing interspersed with abundant doves and robins. Turkey Vulture and Red-tailed Hawk were the dominant raptors, but I was pleased to observe American Kestrel, Common Raven, and even a mature Bald Eagle plying the skies. My best roadside sightings were Scarlet Tanager and Belted Kingfisher, while the most outstanding non-avian wildlife was most assuredly the Red Fox family of a mother and two kits cavorting in the first light of dawn. How about that Chicken? The centerpiece of our absurd occasion is always the effigy of Gallus gallus domesticus crafted over the space of a few days and burned ceremoniously as Saturday’s sun sets. 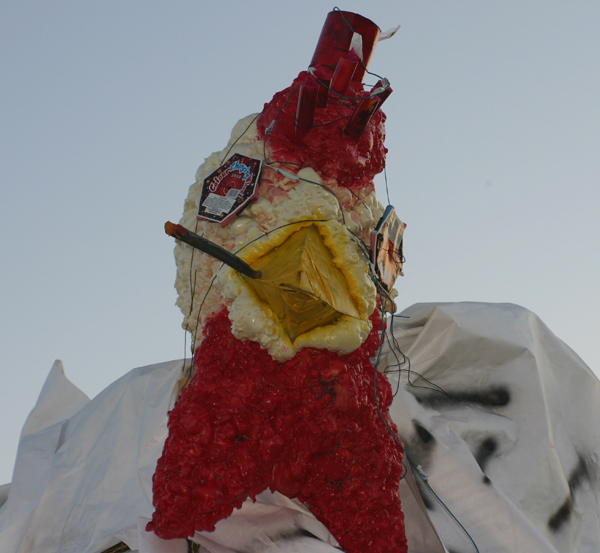 Constructing an enormous statue (this year’s model topped fifteen feet) only to destroy it in a blaze of glory may seem imprudent, but it wouldn’t be a Chicken Inferno without a chicken, would it? Against all expectations, we seem to learn from each year’s efforts. Right now, we may very well be this nation’s finest pyrotechnic chicken construction team. Not only did our bird stand tall and strong, with fused fireworks adoring every appendage, but it actually rotated on an axle set into four-foot concrete pilings. This year’s chicken turned while it burned, a fitting end to a phenomenal long weekend! Burning chickens, birds, food, and booze… it’s difficult to top that. Is that chicken smoking a blunt? I love you guys….kiss the babies for me. The Wood-Warblers Are Back In New York City!